Unfortunately, dogs can get lice, but not the kind humans get. Canine lice is a different species from the species that infest human heads, so canine lice won't transfer to a human, and human lice won't transfer to a dog. Have your veterinarian examine your dog for canine lice. Constant scratching is a sign of canine lice. There are two types of lice that can spread from dog to dog through direct contact or contact with shared items: chewing lice and sucking lice. 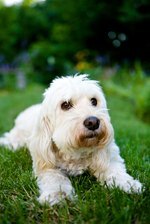 Your dog may have lice if he is constantly rubbing, scratching and biting his body, and if his fur looks dry. Check for lice and nits by parting your dog's fur. You will see adult lice, which are flat, six-legged, wingless insects, moving through the fur and nits on individual hairs. Nits are eggs that look like white dots. Use a shampoo that your veterinarian recommends. If left untreated, lice can cause fur loss and anemia. Ask your veterinarian to recommend a product to kill the adult lice, and follow her treatment directions. To kill newly hatched lice and developing nits, you will need to treat your dog more than once. To prevent a reinfection, disinfect any bedding, furniture and grooming tools, and anything your dog comes into contact with, by washing the items with soap and hot water. Dogs scratch for several reasons. Canine lice isn't the only thing that can cause dogs to rub, scratch and bite. 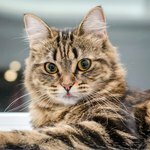 PetMD.com lists six different types of dermatitis that cause similar symptoms: environmental, nutritional, parasitic, allergic, neurogenic and infectious. It is important to see your veterinarian so she can diagnose and properly treat the condition affecting your dog.